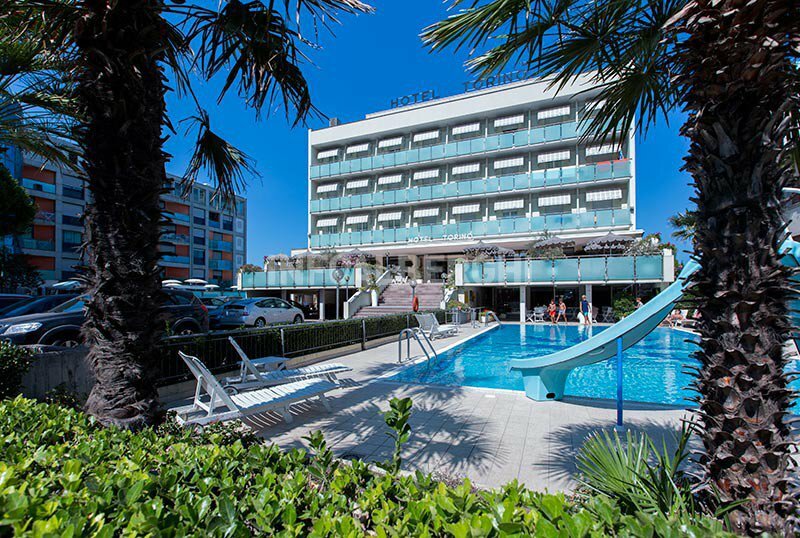 The Hotel Torino , 3 stars of Cesenatico, has a swimming pool, parking, WI-FI connection, services for children and entertainment. Admits animals of small and medium size. The hotel is in Cesenatico, on the seafront, just a few steps from the beach, which can be reached by crossing the road. In 5 minutes you arrive on the canal and in the center. The rooms have a balcony, air conditioning, WI-FI, safe, telephone, minibar, electric shutters, TV, bathroom with shower box or curtain and hairdryer. On request and with supplement: sea view and breakfast in the room. FAMILIES : Family Room available consisting of two connecting rooms and two bathrooms. 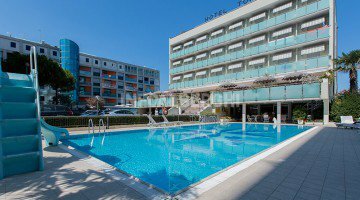 Outdoor pool surrounded by a sunbathing area with sunbeds and beach towels for free use, open-air porch, terrace, bike with child seat and children's bikes available free of charge, reading room, lift, paid laundry, beach towel. It is equipped for cyclists, organizes parties and theme nights. PARKING : uncovered and free available for everyone; 12 indoor seats on request and for a fee. WI-FI : throughout the structure. AIR CONDITIONING : common areas and rooms. CONVENTIONS : beach. For an extra charge: shuttle service and organized excursions. PETS : small and medium-sized pets allowed. A kit dedicated to them is available on request. BREAKFAST : sweet and savory buffet with homemade cakes, croissants, yogurt, fresh fruit, milk, cereals, home-made jams, bread, cold cuts, cold cuts, cheeses, eggs and bacon and products "farm-to-table". LUNCH AND DINNER : 4 starters, 4 seconds, starters buffet, cheese trolley, desserts and much more. VARIATIONS : kitchen for vegans and celiacs, children's menu. In hotel : swimming pool for children, indoor playground area, strollers, entertainment, baby / mini / junior club, indoor playground area, activities and games in the pool and on inflatables, pediatrician and baby sitter on request and for a fee. At meals : special menus, homogenized, baby food, baby seats, afternoon snack. At the beach : entertainment and games. The hotel's swimming pool, which is sunny most of the time, has a slide and a shallow water area for children. Around, sunbeds and beach umbrella for free use, as well as beach towels that can be conveniently requested at reception. The pool area is the center of entertainment activities and hosts, every afternoon, a snack by the pool. The affiliated beaches (Bagno Venezia - Bagno Roma) have well-spaced sunbeds and beach umbrella, sports fields and numerous organized activities, WI-FI, library and live entertainment. Possibility of buying bibs on request!